This Raven just wants to hang around and enjoy a CAWsome holiday! His finish is a series of washes starting with a brown/black to a blue/black and finally a warm black. 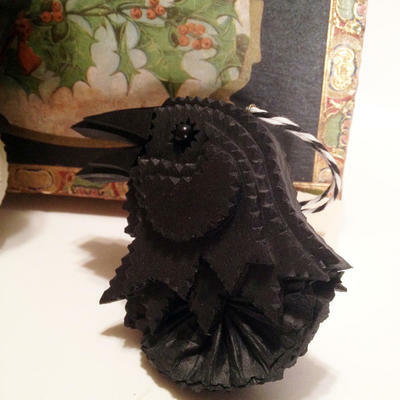 Some crepe paper is handgun and gathered at his neck to represent his feathers. Approximately 13 hand-cut and carved pieces of wood were used in creating this work of art.